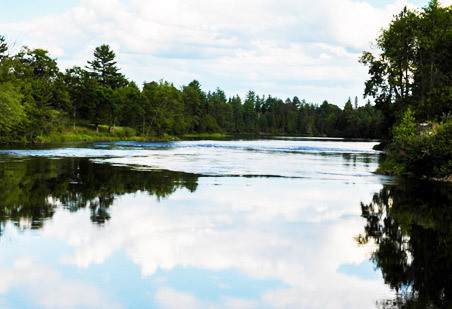 The historic Madawaska River flows close to Algonquin Bound's doorstep. 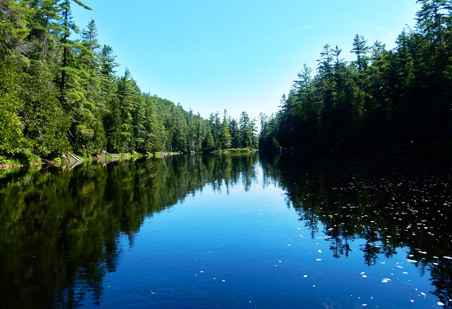 Flowing west to east from the scenic Algonquin Highlands, the river is well known for its whitewater paddling. Fishing enthusiasts will be happy to know that the calm sections also boats some quality fishing opportunities. Good numbers of bass can be found throughout the river and we regularly get reports of lunker sized smallmouth. Also found in the river are northern pike and the odd walleye or pickerel. 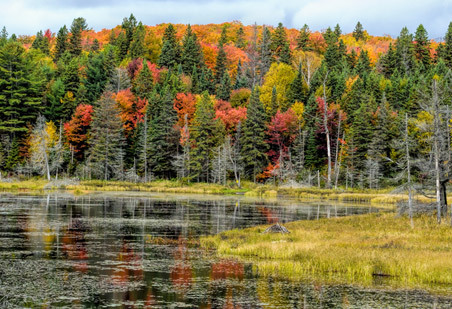 Once a mighty logging river, this historic Algonquin Park river flows southeast out of the big lake and north of Madawaska. Brook trout can be found throughout the river with the best sections reported to be found in the upper reaches beyond Booth Lake. The river is a fantastic stream to paddle and to fish, as there are many little water holes that are perfect for algonquin trout to hide in. Small Panther Martin or Blue Fox spinners or even nymph type fly patterns are effective. Take Note: The river's name comes from the Algonquian for "where one hears a noise like this", which refers to its many rapids. The lower section of the Petawawa River, found in Algonquin Park, flows from Cedar Lake to McManus Lake. Smallmouth bass are prevalent throughout this portion of the river as well as walleye and both can provide for good fishing at times. Muskellunge are also found in sections of the river and fishing success for muskellunge varies. Large musky, walleye and smallmouth bass are all found in some of the larger holes of the river.